My role as the garden designer is to take a softly softly approach, acknowledging the layers of history whilst managing the secession of new plants in an aging garden. To maintain the rural feel of the property, we have decided to keep as much as possible of the old planting, including some species the landscape industry now considers to be weeds. As the old plants slowly senesce and die, we are replacing them with new plants in keeping with Chesterfield’s semi-rural Sense of Place. Many of the new plantings include heritage fruit trees and old fashioned ornamentals like Iochroma cyaneum and the hardy Yellow Day Lily. We have also begun the task of converting a 1950s asphalt tennis court into a large kitchen garden. 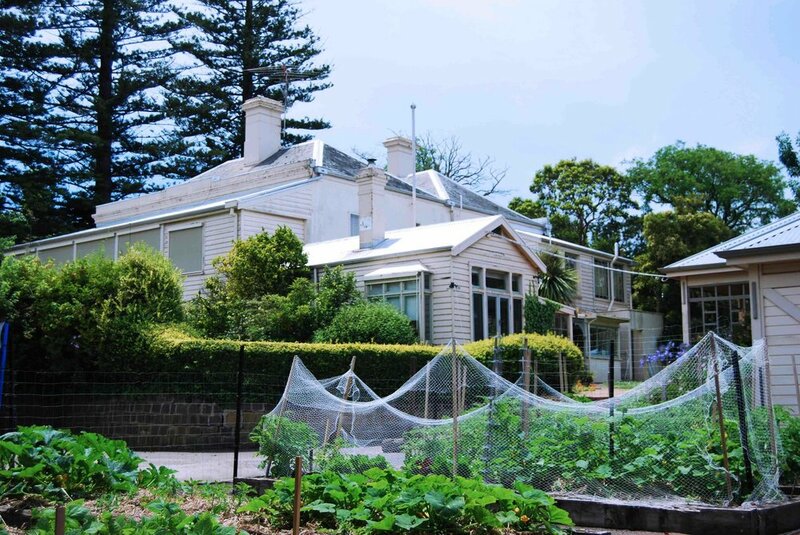 The kitchen garden layout follows the lines of the tennis court, and is filled with heritage fruit trees, a Pomegranate hedge and bountiful crops of vegetables. Nestled nicely into the kitchen garden is Mary-Jane’s art gallery and studio. This is the home of the School of Lost Arts, an organisation that showcases the lesser known creative accomplishments. Apart from the homestead, the main feature of the property are the three 175 year old Hoop Pines lining the driveway. These trees were almost lost to decades of neglect. However, through the tireless efforts of Mary-Jane and Chris, the Hoop Pines are beginning to thrive once more (with help from a little extra water, mulch and many liters of worm wee!). This is an ongoing project, and like all good gardens will never be complete; there is always something to be moved, replaced and tweaked. That is the joy of gardening and the magic of Chesterfield.